Touted as one of the wonders of the world and a UNESCO World Heritage Site, Ha Long Bay is one of the most famous tourist attractions in Vietnam that draws in thousands of visitors every year. 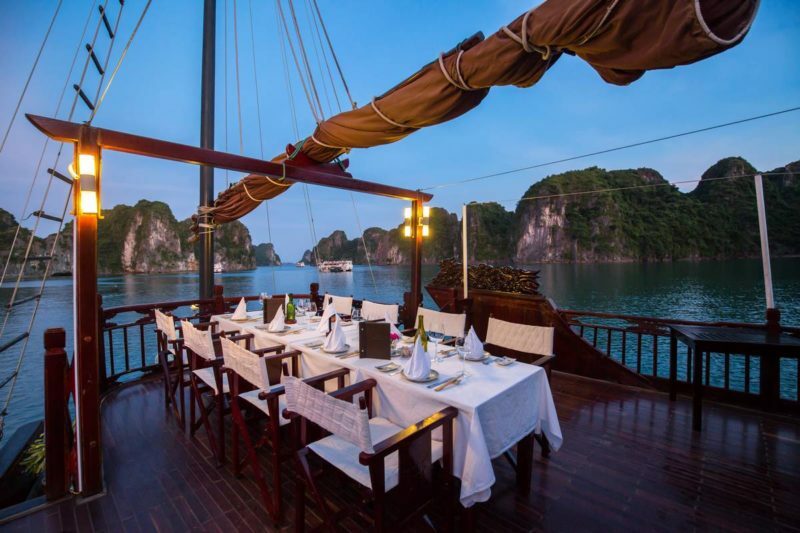 The Tastemaker experienced the magical tour of both Ha Long Bay and Bai Tu Long with a luxury junk cruise with IndoChina Junk. 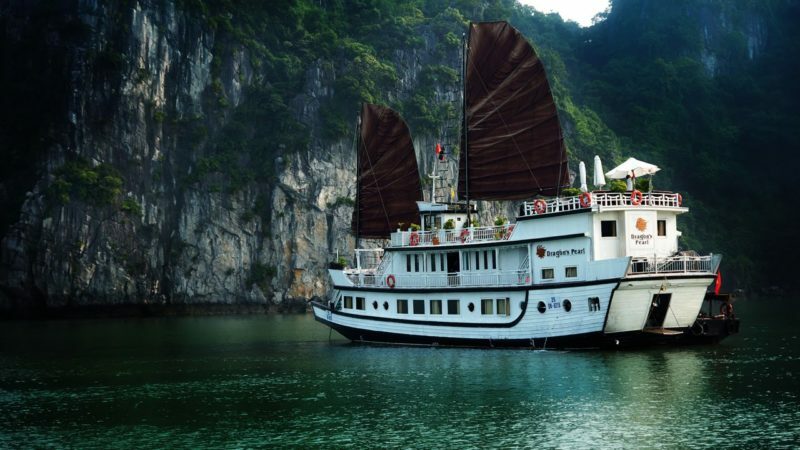 Indochina Junk boasts a large fleet, including 2 Dragon Legend ships featuring 24 luxury cabins, 4 decks with both inside and outside restaurants, a spa, bar, sundeck area and other entertainment options. Cruises range from a two-day, one night expedition, to longer journeys. Each cruise is different – from the larger, Dragon Legend ships to a more personalised one-cabin experience, guests can choose their level of privacy and engagement with other parties. 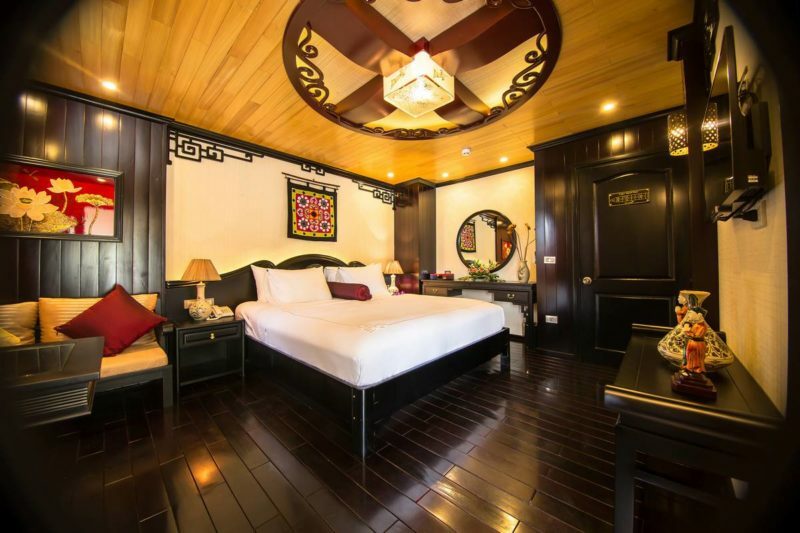 The rooms are large and super luxurious. With fluffy pillows galore, a plasma TV, a sophisticated sitting area and glorious large bathrooms with inimitable views over the water, you’d be hard pressed to find any fault with the room. Other facilities on board include an amazing salt-water jacuzzi and sun lounge chairs, a beautiful and boutique spa, as well as many look-out points for those picture-perfect moments. We loved the activities such as kayaking (or cruising) through the enigmatic rock formations, exploring nearby caves and swimming off the side of the junk (for the daredevils). These were made all the more enjoyable by our incredibly friendly and knowledgeable tour guide who was undoubtedly one of the highlights of the experience. Meals can be taken indoors or on the outside deck, affording epic sunsets and morning views. Our only criticism at this point would be the quality of the food: it is unashamedly Vietnamese in style and slightly underwhelming. Should you not like it, there is little by way of alternative unless you have brought your own snacks. When prices are this steep ($250 per person), one feels that meals – as a crucial component of the experience – should be better. Yet when all is said and done, this truly is a once in a lifetime experience that will take your breath away. With IndoChina junk, you know you’ll be in the best of hands.